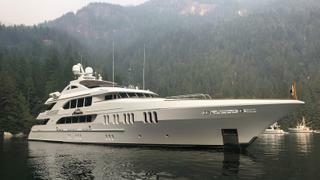 The 50 metre motor yacht Aspen Alternative, listed for sale by Neil Emmott at Superyacht Sales & Charter, has had a further price reduction of $500,000. Designed by Geoff Van Aller, Aspen Alternative was built in aluminium by US yard Trinity Yachts to ABS class and MCA coded with delivery in 2010 and a refit in 2016. A bright and airy interior by Sylvie Charest accommodates 10 guests in five cabins, comprising a main deck master suite, two VIP suites and two doubles, all with state-of the art audio/visual systems and en-suite bathroom facilities. The inviting main saloon of this yacht for sale has a selection of couches and an assortment of loose furniture to comfortably accommodate a large party. Forward is a dining area seating 10 guests with port and starboard buffets storing glassware, china and cutlery. The exceptionally large full-beam skylounge has three large windows with electric blinds to port and starboard and is comfortably furnished with two separate seating areas for guests to relax completely. Forward is a U-shaped wet bar area with polished stone tops and three bar chairs. The upper deck aft has teak decking, overhead lighting, ample seating and a large varnished table, while to starboard there is a built-in varnished wet bar and buffet. Up on the sun deck, the aft section offers a large Jacuzzi and sun loungers, while under the covered archway to the port side is a wet bar trimmed in varnished teak and five bar stools. Twin 2,250hp Caterpillar diesel engines power her to a top speed of 20 knots and she is fitted with Quantum zero-speed stabilisers. Lying in Fort Lauderdale, Florida, Aspen Alternative is now asking $17,900,000.